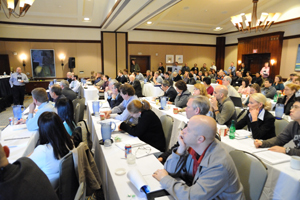 Even with global economic instability, the prospect of a potential H1N1 outbreak and raging winter snowstorms on the East Coast, MSACL 2010 was a great success. 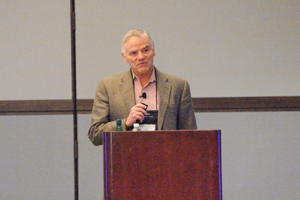 We were extremely fortunate this year to have Dr. Leroy Hood as our keynote speaker. His talk on the future of medicine and its progress toward being predictive, personalized, preventive and participatory (P4) was extremely well-received and stimulated thought and discussion that pervaded the conference. Thanks again to Agilent Technologies for making it happen! We have been fortunate in the amount of scientific interest and support that has been garnered by the conference; this is largely driven by the scientific content. Not including exceptional plenary presentations, three Scientific Tracks hosted seventy-eight (78) 30-minute podium presentations. 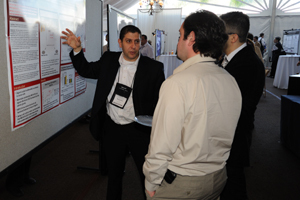 In addition, the oral presentations were supplemented by 100 posters. Of these posters, sixty (60) were selected to be presented as PosterSplashesTM. 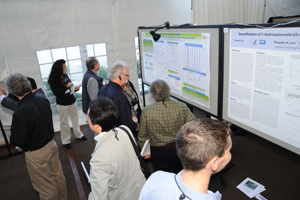 PosterSplashes involve 3-4 minute slide-based podium presentations providing a thumbnail overview of the selected posters with Q&A follow-up at the poster itself in the Exhibit Hall. This was the first year of the PosterSplash and, having been well-received, will likely remain a fixture into the future. Attendance this year climbed to over 450. This was on the high end of our early estimates and pushed the capacity of some ballrooms to overflowing. With many presentations standing room only, the atmosphere encouraged collegiality mixed with a healthy dose of active and animated discussion. Although the Hyatt, with its relaxed and pleasant ambiance, will be missed, the growth of the conference has necessitated its move to a larger venue. 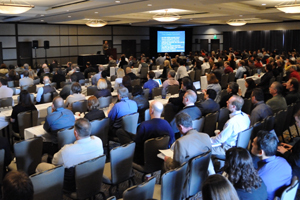 MSACL 2011 will be held at the Sheraton San Diego Hotel & Marina. The Exhibit Hall housed 23 exhibitors, a projection TV for the SuperBowl on Sunday, and the posters on Monday and Tuesday. 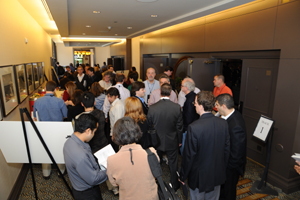 Receptions were held in the Exhibit Hall on Sunday night (sponsored by PerkinElmer), Monday night (sponsored by PerkinElmer) and Tuesday night (sponsored by AB Sciex) providing ample opportunity for the attendee base to peruse the cutting edge in mass spec technology. Lunch further provided an opportunity to explore both the posters and the vendor exhibits. 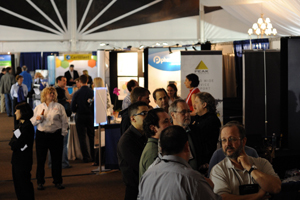 Due to snowstorms on the East Coast many attendees extended their stay through the last day of the meeting making for a well-attended closing reception. Following a buffet dinner in the Palm I/II ballroom, the reception moved to the Hyatt Penthouse, which occupies the entire top floor of the main tower. Many made it up in time to catch the sunset (see below). It was a little breezy and chilly once the sun went down, but an amazing experience. And as for every reception at MSACL, we were able to sample an exceptional array of wines. Thanks again to Quest Diagnostics for sponsoring the late evening receptions (Hospitality Suites) on Sun, Mon and Tue and the closing reception on Wed! 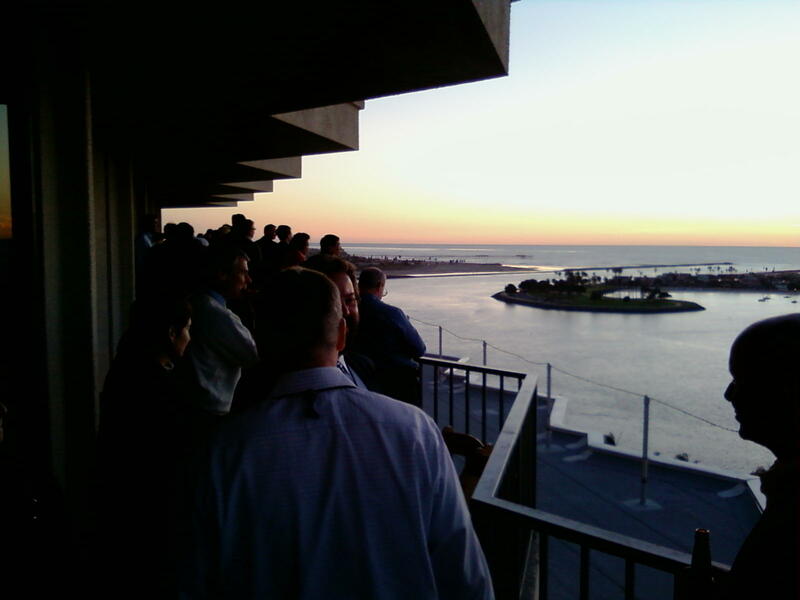 I'm looking forward to MSACL 2011 at the Sheraton San Diego Hotel and Marina. Hope you can make it!